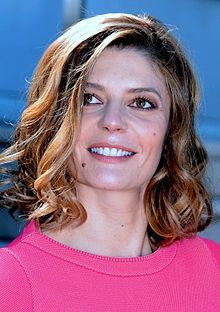 Chiara Charlotte Mastroianni (28 May 1972) is a French actress and singer. She is the daughter of Marcello Mastroianni and Catherine Deneuve. Mastroianni earned a César Award nomination for her first feature film appearance in André Téchiné's My Favorite Season (1993), starring her mother in the lead role. The next year she appeared in Robert Altman's Prêt-à-Porter. Her first starring role came in 1995, opposite Melvil Poupaud in Le Journal du séducteur, a romantic comedy inspired by "The Seducer's Diary" chapter from Søren Kierkegaard's Either/Or. She worked with Poupaud again in Three Lives and Only One Death (1996), playing the daughter to her real-life father, and in Time Regained (1999), also starring her mother. Along with a few supporting performances in French films, she appeared in Gregg Araki's Nowhere (1997) and took time off to have her first child with sculptor Pierre Thoretton. She returned to filmmaking to star in the leading role of Manoel de Oliveira's The Letter (1999), based on the novel La Princesse de Clèves by Madame de La Fayette. In July 2016 she was named as a member of the main competition jury for the 73rd Venice International Film Festival. In 2002, Mastroianni married Benjamin Biolay; the couple divorced in 2005. ^ "'Chicken with Plums' full of the unexpected". The Boston Globe. 20 September 2012. Retrieved 21 September 2012. Wikimedia Commons has media related to Chiara Mastroianni.